An upgrade to the BlueJeans Network online meeting service includes a new UI with improved audio and video quality, support for Amazon’s Alexa for Business and Microsoft Teams, and streaming via Workplace by Facebook. In a market saturated with web- and video-conferencing services, including some bundled with existing tools such as Microsoft Skype for Business offered with Office 365 and Google Hangouts with G Suite, how can a premium provider stand out in the crowd? BlueJeans Network launched seven years ago effectively to focus on staying one step ahead of the mainstream. In its latest move to push forward, BlueJeans is rolling out a new user experience with improved audio and video and support for new forms of interaction. 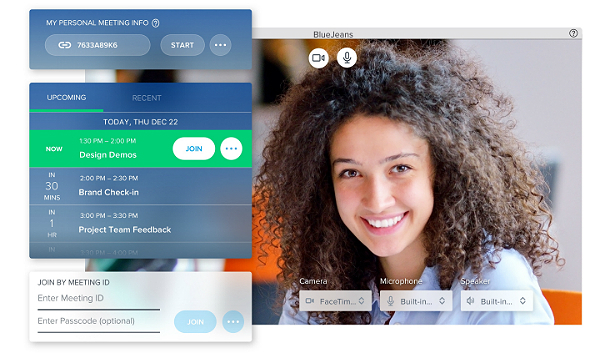 BlueJeans’ new videoconferencing app, released Wednesday, is a significant upgrade that supports improved video quality with less lag, a simplified user interface (UI) and clearer sound with the addition of Dolby Voice throughout the entire audio chain. The company has also added new AI-type voice controls with support for Amazon’s new Alexa for Business, enabling the use of the Amazon Echo as a voice-activated speakerphone, and Voicera’s new Eva virtual assistant (now in beta), and digital inking through integration with Kaptivo conference whiteboards. BlueJeans, which already integrated with Skype for Business, now also works with Microsoft Teams chatbots and it lets customers stream their meetings on Facebook for Work. The new UI and features added to BlueJeans comes in a crowded market of players of online video and web conferencing media service providers. Besides Microsoft and Google, the list includes Amazon, Cisco, GoToMeeting, LogMeIn, PGi, Vidyo, Zoom and a slew of others. 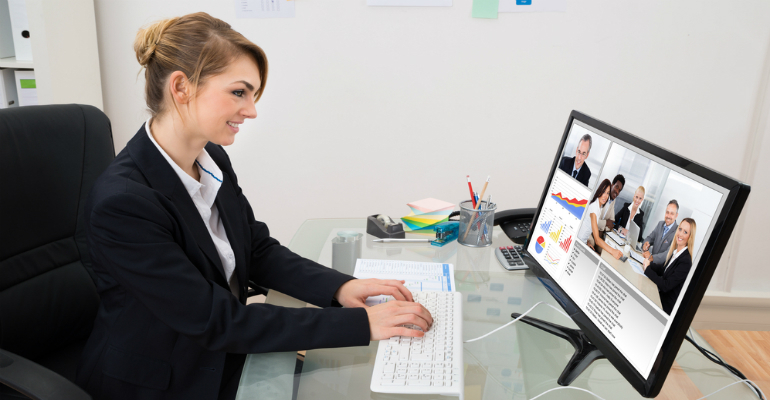 Many cloud PBX providers are adding video and screen-sharing collaboration features to their calling services. BlueJeans hasn’t disclosed how many commercial subscribers use its service, but a spokesman said half of its sales go through channel partners, ranging from large resellers such as CDW, to specialists including Conferencing Advisors. In total, 65 partners offered BlueJeans last year, according to the company. While many customers can easily purchase and set up web-conferencing services on their own, there’s a viable market for those who require integration with hardware, applications and other service providers, according to Walter Somsel, CTO of Conferencing Advisors, which first became a BlueJeans partner when the service launched in 2011. While Conferencing Advisors carries most major online and hardware providers’ services and products – many insist on Cisco and Microsoft – others that require richer meeting experiences, notably in conference room environments, will go with BlueJeans, Somsel said. Many customers use BlueJeans in place of services such as Skype for Business, while for others, it’s additive. In addition to BlueJeans’ interoperability, Somsel said he recommends the service because it’s reliable, secure and produces high-quality meetings. Also, a benefit of BlueJeans is its native integration with most major services, providing extensibility among offerings, according to Somsel, who also argues many solutions are fine for desktop conferencing but don’t scale as well. “A lot of the desktop apps like [Cisco] WebEx, GoToMeeting and Skype for Business don’t translate well in a conference room,” he said. Somsel started testing the upgraded app several months ago in preview and said it’s a significant improvement. While BlueJeans already had a partnership with Dolby Labs, the integration of Dolby Voice and the Dolby Conference Phone throughout the stack, its digital-signal processing and noise-cancelling algorithms provide wider bands of audio, hence a noticeable improvement in sound quality, Somsel added. BlueJeans has also added new management, reporting and security to the service. The added reporting capability includes new performance metrics. The company also said it now has met SOC 3 certification, which provides audited validation required by many enterprises. The service comes at monthly subscription rates of $12.49 per user for small businesses with up to 50 participants, $16.65 for premium accounts with added management support and integration — and corporate plans with 100 participants or more are quoted on a custom basis though a partner or the company.